I have been looking for a list of economists who support Ron Paul for president. I constantly get the following comment from other economists, “Ron Paul doesn’t know what he’s talking about. He’s for the gold standard.” I would like to show these doubters a list of economists who say Ron Paul does know what he’s talking about. My answer is that although one could be drawn up, no list of economists is going to satisfy skeptics like this. The profession is committed to fiat money. No one learns anything else, except by accident and in caricature. When someone has such an entrenched intellectual and professional commitment to a particular way of thinking, you are wasting valuable time trying to change his mind. Speak instead to the undecided and/or the young. “What’s so great about the ‘mainstream’? You mean the mainstream that couldn’t see an epic financial collapse coming? That mainstream? 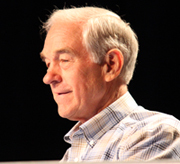 The mainstream that has so little shame that it looks at a prophet like Ron Paul — who predicted all the way back in 2001 exactly what would happen, having perceived the ingredients of a financial bubble — and claims he doesn’t know what he’s talking about? I’d say it’s the other way around! “The British achieved the most pronounced and sustained economic growth of any society in the history of the world while on the classical gold standard, which had been abandoned and replaced by the gold exchange standard by the 1920s. There have not been fewer and shallower recessions since gold was abandoned, and the panics of the 19th century were caused not by gold but by inflationary paper money. Banking crises have skyrocketed, with 124 of them from 1970 to 2007. “What we have had is a dollar that’s lost over 95 percent of its value, while it held or gained value before the transition to fiat money. Think about what that means for people’s ability to save for old age. “Finally, let’s be serious. Wouldn’t it be nice for there to be some nature-given constraint on the so-called public servants who fleece us and pile on debt like there’s no tomorrow? Gold can’t be photocopied, or invented by a Fed keystroke. That ought to keep the bums shackled a bit. And finally, for what it’s worth, Ron Paul is not calling for gold per se but for currency competition, which may indeed yield gold but as a free choice of actors in the marketplace rather than by government fiat. I discussed this with him in our interview last year about his book Liberty Defined.